Colors may speak to the consumer on a more emotional level, but clearly all the colors will not sell equally well. Some colors will not be reordered as frequently. Some may be discontinued. The multi-colored product line has lately become so de rigueur, that I wonder whether a spectral array of products really stands out much any more. Do multi-colored product lines sell better? Some product line packaging, while still multi-colored, shuns the obvious choices (red, orange, yellow, green, blue, purple) in favor of more subtle, not-so-intense pallets: pastels, tertiary colors and beyond. 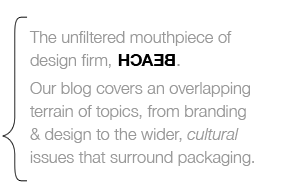 That may be a step in the right direction, but I applaud those that experiment with different means of differentiation—patterns or typography for example. If it’s food your selling, I get it. The oral/visual appeal of appetizing color cannot be denied. 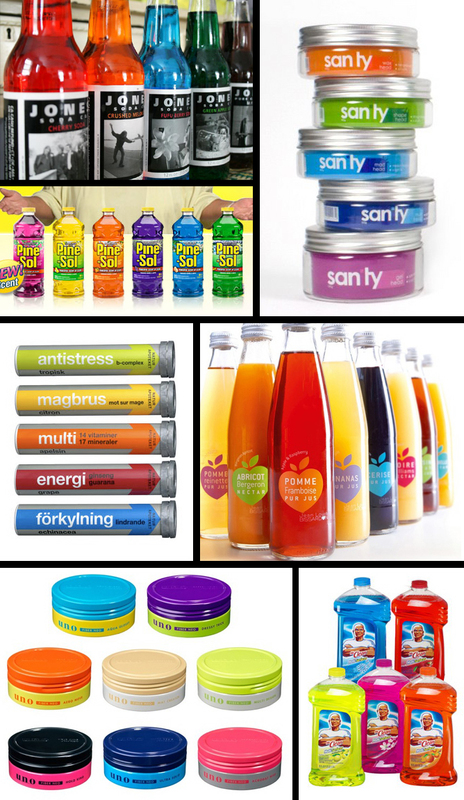 But why the delicious-looking, candy-colored cleaning products? I work with packaging for gift baskets and it is all about color. We will pack the same product, same flavor in a variety of colors just so they match different colored or themed baskets. And we do the same popular tried-and-true colors over and over just because those are the ones that sell. And also because there will be a bigger concentration of products from other brands in these same colors, so they will be easier to match.